Fears of a bomb outside Treasury Secretary Steve Mnuchin's Los Angeles home turned out to be a waste -- literally. Police were called at 7:30 p.m. PT about a suspicious package left in the driveway next to Mnuchin's home, but addressed to the treasury secretary. The bomb squad was immediately summoned to check on the package -- only to discover it was manure. The package was signed as being from "the American people," according to KABC. The scene was cleared by 9:30 p.m. and no evacuations were ordered, police said. It's unclear whether Mnuchin or his wife, actress Louise Linton, were home at the time. The former Wall Street hedgefund manager purchased a $12.6 million home in Washington, D.C. earlier this year,according to Realtor.com, and also owns a home in the Hamptons and an apartment in Manhattan, in addition to the Bel Air mansion. President Trump's treasury secretary has drawn scrutiny over requesting a government plane for his honeymoon to Scotland, France and ltaly this summer. He did not end up using the taxpayer-funded jet to fly to Europe after the request sparked an inquiry by the Treasury Department's Office of Inspector General, sources tell ABC News. 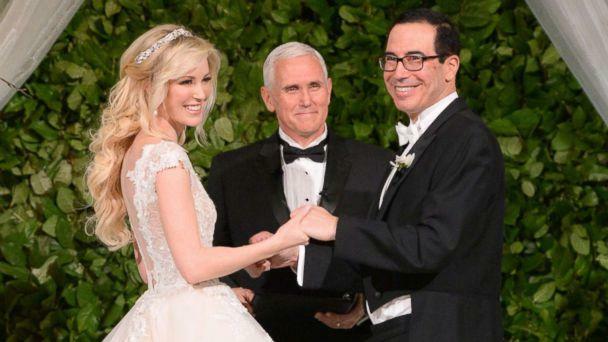 Vice President Mike Pence, center, officiates the wedding of Louise Linton, left, and Secretary of the Treasury Steven Mnuchin, June 24, 2017 at Andrew Mellon Auditorium in Washington, D.C. But he has also drawn ire for using private government jets at unnecessary taxpayer expense when a commercial flight would serve the same purpose. Mnuchin reportedly took a government jet to Kentucky in August, which the inspector general reviewed after Senate Majority Leader Mitch McConnell shared photos of them watching the eclipse. Mnuchin said the trip was not to view the eclipse, but instead was government business. Mnuchin's wife, Linton, largely sparked a widespread inquiry into Trump administration officials improperly using government-funded private planes when she shared an instagram picture in August returning from that trip to Kentucky, bragging about her high-end Rouland Mouret pants, Tom Ford sunglasses, Valentino high heels and Hermes scarf. The scandal led to the resighnation of Health and Human Services Secretary Tom Price in September over repeatedly chartering private planes for government travel.